The Arabic daily Elaph reports that hundreds of Kurds who came into Afrin from other Kurdish cantons in northern Syria staged a demonstration in the city Tuesday evening against the Turkish invasion. 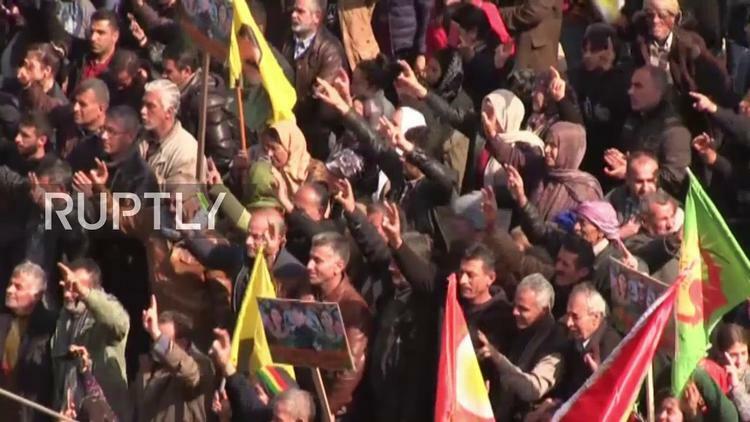 Kurds drove from the northeast, from Qamishli and Hasaka, and from Kobane, through Kurdish-held Manbij and through territory around Aleppo held by the Syrian government, to Afrin, which is besieged from the north by Turkish forces and Syrian Arab fundamentalist auxiliaries. It is alleged that some of these arriving Kurds are YPG militiamen. The movement of Kurds from the northeast, where they are allied with US special operations forces in continued mop-up operations against ISIL terrorists, is an embarrassment to the Trump administration in its tense relationship with Ankara. The US had pledged that the Kurdish forces it is arming and training would only be deployed against ISIL (the so-called Islamic State Group or Daesh) in eastern Syria, never against Turkey itself. Syrian Kurds mostly follow the leftwing Democratic Union Party, and its paramilitary, the People’s Protection Units or YPG, are the troops allied with the US. Turkey considers the YPG an affiliate of the Kurdistan Workers Party (PKK) in eastern Anatolia inside Turkey itself and along with the US brands the PKK a terrorist organization. The US does not agree that the YPG is a terrorist organization. The YPG has been the main effective ground force fighting Daesh/ISIL in eastern Syria, a task Turkey largely declined to take on. Despite conducting a few bombing raids against it, Ankara has tended to see ISIL as way to weaken the Syrian government of Bashar al-Assad, whom Turkish President Tayyip Erdogan wants to overthrow. The hundreds of outside Kurds who came to Afrin and demonstrated are staying in the homes of locals. 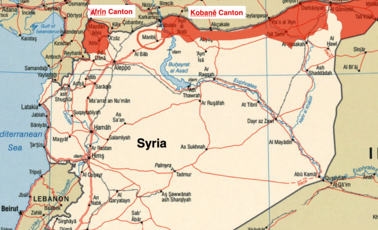 There are 500,000 Kurds in the Afrin canton, who are not connected territorially with the Kobane and Jazira cantons where the other 1.7 million Syrian Kurds live. Many of these Kurds have crowded into Afrin city itself, more than doubling the city’s pre-war population. Kurds are about 10 percent of the Syrian population. Critics of the YPG accuse it of seeking to ethnically cleanse Arab villages between Afrin and Kobane so as to create a contiguous Kurdish region called “Rojava.” Kurds deny these claims and point to extensive YPG cooperation with Arab militias in the northeast. Turkey accuses the YPG in Afrin of shelling Turkish towns across the border. Turkey invaded northern Syria, targeting the YPG in Afrin, on January 20, and is said to have taken 15 villages and one town in the region. The United States and Russia appear to have given Ankara green light for the operation, since they control Syria’s air space in the north. The Syrian regime objected, reaching out to the Kurds, but has not done anything practical to stop the Turkish assault. The YPG Kurds have succeeded in destroying a Turkish tank, killing six soldiers, and have shelled Turkish towns along the Syrian border, but Turkey claims to have killed hundreds of Kurdish fighters. Some observers say President Erdogan intends to take Afrin city itself. Presumably that operation would aim at ethnically cleansing the Kurds from the area, chasing them to the northeast, and Arabizing it with fundamentalist Syrian allies.